The Pearl River Basin is located in east-central and southwest Mississippi and in the southeastern part of Louisiana, and drains an area of about 8,000 square miles. The river extends from its headwaters in Neshoba County through the Jackson metropolitan area and empties into the Mississippi Sound. Major waterbodies include the Pearl, Yockanookany, Strong, and Bogue Chitto Rivers. The basin also includes the state’s largest surface source of drinking water, the Ross Barnett Reservoir. MDEQ monitors the quality of surface water throughout the state. Monitoring data and information are used to make water quality assessments. Assessments are general characterizations of water body health. The state’s most comprehensive assessment report is the Federal Clean Water Act Section 305(b) Water Quality Inventory Report. For more information about the 305(b) report and the water assessment process, please go to the Assessment Section Quick Link. The most recent 305(b) report with assessment information for this basin can be found at the link below. Surface waters (e.g., streams, rivers, lakes, estuaries, etc.) are assigned intended uses. These designations allow regulatory agencies to establish water quality goals which protect aquatic life and allow safe use by the public. These goals are referred to as Water Quality Standards. The designations that exist in Mississippi are Public Water Supply, Shellfish Harvesting, Recreation, and Fish and Wildlife (i.e., Aquatic Life Use Support and Ephemeral). 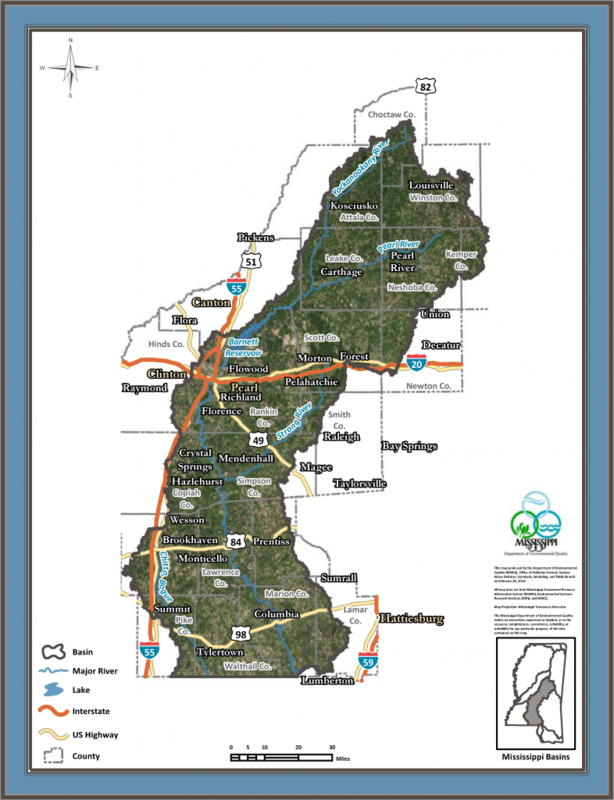 Click the link below for a map or a list of the designated waters of the Pearl River Basin. For more information, contact Donetta McCullum.